I'm a big fan of black and white, and when it comes to clothes I love blacks and greys, so the monochrome trend that's taking over pretty much all of the high street at the moment is taking over my current wish list big time! These are some of my favourite pieces, and they are all from Internacionale. I love all three crop tops so much, and although I don't exactly have the figure to wear crop tops, I'd wear these with high waisted shorts or with disco pants and a leather jacket on top. The striped bandeau is idea to wear underneath baggy fitting vest tops, and would look great under black or white, or even a neon coloured vest for a pop of bright colour. The two little skater style dresses are very much to my taste, and I'd wear these all the time, for pretty much any occasion. Midi dresses are currently one of my favourite looks for a night out, I especially like the one with the cut out mesh panels, this would look lovely with a neon clutch bag and some high heels. 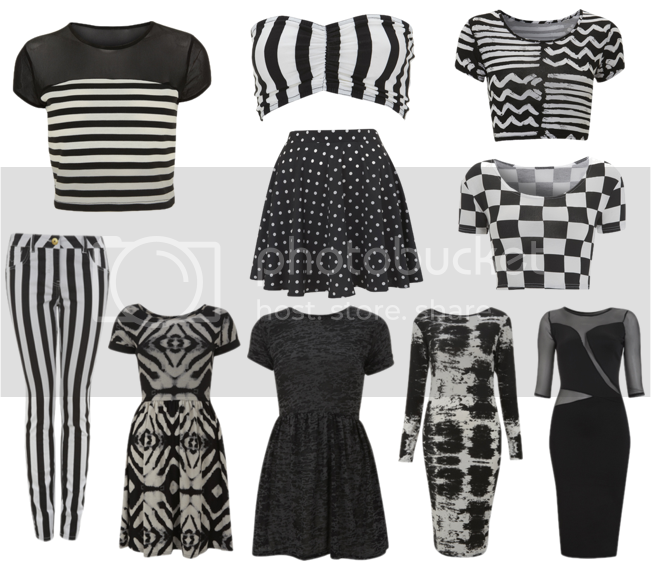 Do you like the monochrome trend? I like monochrome when it's patterns and not just block colours. If I wear all black items it just reminds me of uniform from working as a barmaid or waitress.